I love looking through people’s tumblrs, I don’t personally have an account as I have plenty of accounts that collate beautiful pictures, videos and songs it would be too confusing to get yet another account. I recently got linked to Electric Raspberry run by the beautiful Amanda Lynn and I love everything she posts. It’s so nice as well that she doesn’t constantly post gifs but just gorgeous inspirational pictures and music. I enjoyed every single song on the first 20 pages of her tumblr that I decided to make a playlist on spotify of every song, this is just because I didn’t want to a) have to remember the songs and b) scroll through each page to find the song. I hope you enjoy her blog as much as I do. I’ve never been a massive fan of peplum, but since seeing Cat Deely in her white Stella McCartney top and seeing an almost identical one the other day in Topshop, I decided that maybe it’s not all bad. Her outfit is so simple and chic. I’ll certainly be investing in the lookalike next time I’m in town. 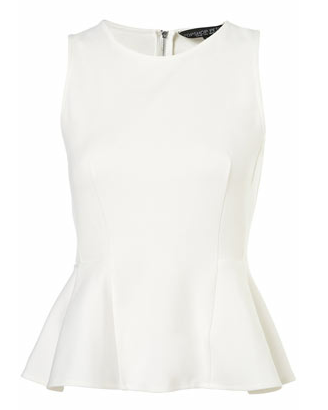 What do you guys think of peplum, would you wear the trend? I thought I would share my love for the free TV CatchUp app for the iphone by GZero which I don’t think my lazy self could do without. So many times I find I can’t sleep but I’m too cosy and comfortable in my bed to move so I switch on my iphone or ipad (i downloaded it onto both) and use the app to watch TV all for free. I swear it also has more channels that my normal freeview reception gets which is brilliant for late night episodes of QI or Big Bang Theory, if you don’t have it already get it get it get it!